Did you know that this year the American Statistical Association (ASA) is celebrating its 175th anniversary? That’s a pretty significant birthday! On the ASA’s 175th anniversary webpage, they publish blog posts periodically that cover ASA happenings, such as anniversary events and celebrations, as well as interesting tidbits about the organization. 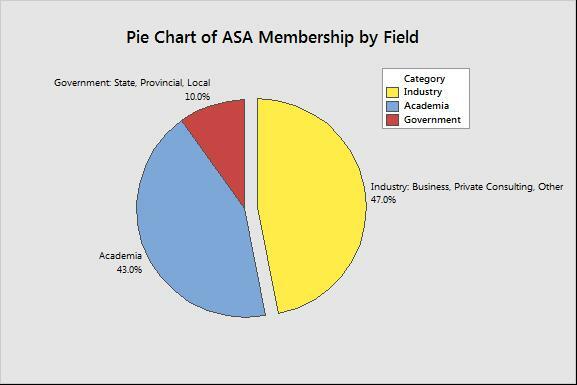 Recently, they published a post covering the demographics of ASA membership during its 175th anniversary year. 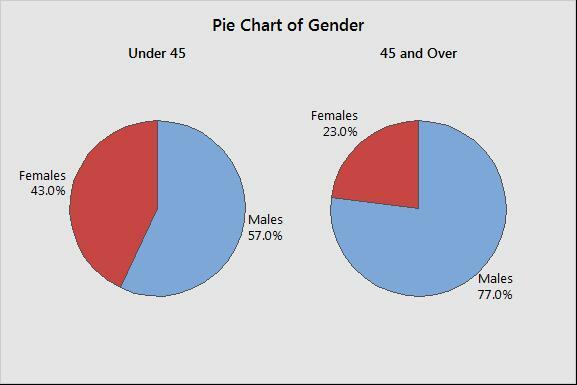 I thought it’d be fun to show off this demographic data using Pie Charts in Minitab. I don’t know about you, but I find it much easier to digest data that’s been brought to life graphically! 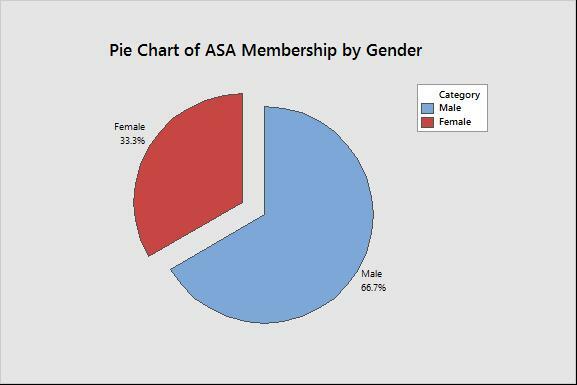 Below you’ll see a pie chart that highlights the percent of ASA members who are women versus those who are men. 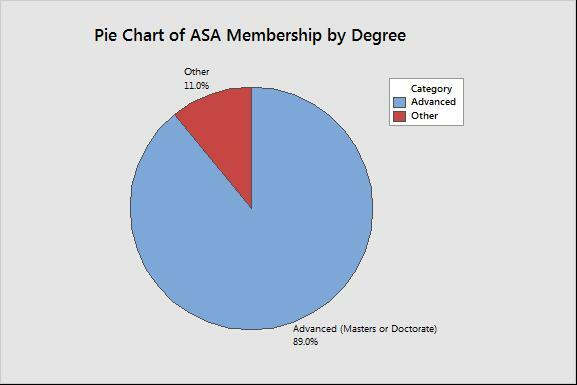 (Keep in mind that of the ASA’s about 19,000 members, only 75 percent have provided demographic information, such as gender, age, race, etc.) Women make up about 1/3 of ASA members. Minitab Pie Chart Trick: Do you see how it appears that the red female pie slice has “exploded” in the chart above? To expand a slice while you’re working with Minitab Pie Charts, select and double-click on the pie or slice of the pie and click on the Explode tab. Minitab Pie Chart Trick: You can create a “double” pie chart in Minitab by arranging your data in different layouts in the worksheet. For a step-by-step tutorial on how to do this in Minitab, check out the support article here. 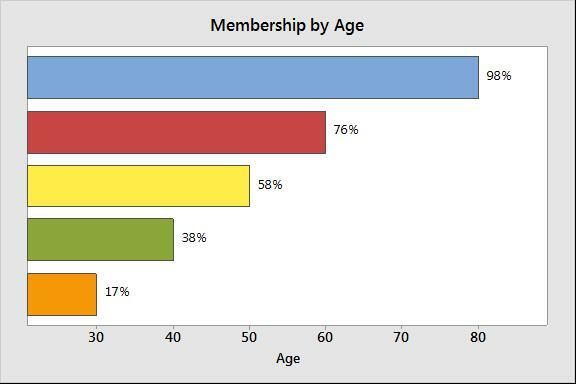 17% of members are 30 or under, 38% are 40 or under, 58% are 50 or under, and 76% are 60 or under. Only 2% of members have reached the age of 80. Where are ASA members from? Not surprising, but most are from the United States and Canada, with several other countries falling inside the ‘Other’ slice—including (from largest to smallest) Japan, Australia, United Kingdom, China (including Hong Kong), Germany, Italy, Switzerland, South Korea, Belgium, and the Netherlands. 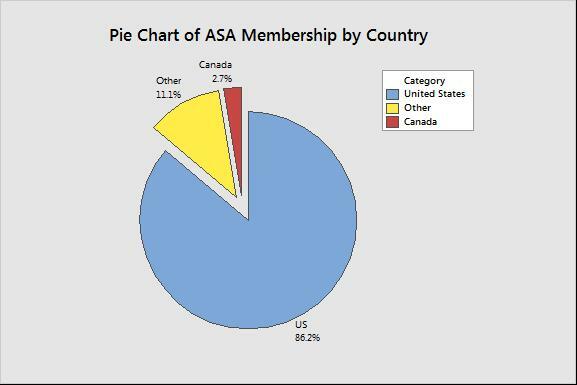 It’s also noted in the ASA blog post, but I did find this surprising: people from 94 countries belong to ASA and 1 in 9 members are from outside the United States. Happy 175th ASA – here’s to many, many more years! When is the last time you created a pie chart? Tell us in the comments section below.